In designing this coax horn speaker, the we give much consideration to wide coverage in the unit’s application. Imagine going to a concert and finding out that your seat had a great sight line, but the sound system covered only one person in the audience. Would you join the line of people asking for their money back? Many loudspeakers intended for home use have a very narrow sweet spot. Is there an implicit assumption that people who listen to music have no friends? Maybe these speaker designers have never been moved enough by the music that they wanted to get up and dance? Do these people really sit in a chair and just listen to music? The reason to design loudspeakers with a narrow coverage angle is to reduce the effect of the room’s acoustic character on the reproduced sound. A difficulty is keeping the coverage angle uniform over the entire audio frequency range, due to the large variation in wave lengths. The simplest method to produce pattern control is the sound column, in which multiple drivers all reproduce the same range. Due to the length of the column, the resulting interference and reinforcement pattern reduces the long axis coverage angle. A 20Hz tone has a wavelength about 56’. This would re quire your sound column to be 28’ tall to limit the dispersion on a single axis to about 45°. At 20kHz the same column would need to be just under 3/8”. One advantage is that by confining the energy to a smaller area, more energy is delivered there, thus the on-axis sensitivity is higher. There are other pattern control devices besides a sound column, such as a horn system or a phased array. Control ling the coverage angle or dispersion is certainly a valid approach for difficult rooms. Some folks even prefer directional control in otherwise good rooms. This is one of those areas of audio open to enlightened debate. Because I like to listen to music while working at my desk, in the shop, or pretty much everywhere, sometimes other people listen with me, which requires a different set of conditions. My preference for music reproduction is for the room acoustics to enhance the sound. To me this requires a room with less absorption and rising reverb at low frequencies, no hard focused echoes, and a smooth short reverb tail. For those who think the room should add nothing to what is coming out of the reproducer loudspeakers, I suggest you visit an anechoic chamber. Many recording studios approach that level of absorption; this is one of those audio points on which opinions may differ, and the other guys are just wrong. To achieve a rising reverb time at low frequencies requires solid walls, floor, and ceiling. If the surfaces are flimsy, some low-frequency energy will flow right out of the room, be lost moving the wall materials, and to a minor ex tent reradiate back in, sometimes even at a different frequency! This is different than noise control where the goal is to keep sound from annoying others. The methods for isolation differ from enhancing reverberation. For isolation it is possible to use diaphragmatic absorbers, add mass, or (my favorite) loose particle-filled floors. Imagine a normal hollow floor filled with perlited gypsum (kitty liter); as the low frequencies move the particles, they rub against each other and thus absorb the energy. Normal room furnishings such as carpet, drapes, and furniture absorb the midrange energy and more so the highs. It is possible to have too much absorption if there is good low-end containment; the unbalanced combination will produce a muddy-sounding room. The treatment is either less absorption or special bass absorbers. The other end is not enough high-frequency absorption. You can improve this with rugs, furniture, or, for tweaks, foam or other products from advertisers in this very magazine. Obtaining a uniform sound field—if that is your goal—requires the basics: no parallel surfaces that are untreated and objects in the room that refract or scatter the sound field. Think of the sound field as a balloon. As you add air, it becomes bigger, just as a sound wave would propagate. If you press it against a flat wall, it will give you a single reflection. Press it against a wall of furniture, and it will show you the multiple small surface imprints which will model the smaller and smoother reverb. PHOTO 1: The completed coax horn speaker. A while back a friend with a TV studio asked me about the acoustics of his control room. I did a quick survey: a large room with enough volume to have a true reverberant field for most of the frequency ranges of concern, two speakers on the front wall, equipment racks to the side, carpet on the floor, medium-quality acoustic tile for the ceiling and drywall on the back wall. The reverb time was good for a room this size; al most all of the sound hitting the mix position was well behaved except for a little too much echo from the back wall. The solution was “some bookshelves on the back wall.” Someone had suggested that it was more fitting to install some specialty panels on the back wall, add diffusers to the ceiling, and cover many of the walls with closed cell foam. Shortly thereafter I had the opportunity to meet with many of the major manufacturers of audio test gear, so I scheduled a measurement session in his space with five or six of the equipment manufacturers to demonstrate their gear. After the measurements (T.E.F., T.D.S., S.T.I., and so on), my friend asked the group for their suggestions. One of the invited engineers said in his impeccable English (with just enough of his native Danish showing), “Oh, some bookshelves on the back wall are all you need.” The rest of the group agreed. The friend was sure I put them up to it, but he installed three bookshelf units and saved a small fortune. In most small rooms, bookshelves or other large furniture will provide enough short diffuse reverb to complement the music. If the length-to-width-to-height ratio and sizes in the listening room are wrong—causing buildup of specific frequencies—lots of padding will help, but not fix the problem. If the wails or ceiling is not substantial, low frequencies will just flow right out of the room. The simplest fix is to avoid bad rooms for your listening area. Now what you need is a loudspeaker that sounds good off-axis as well as dead center. It would also be nice if it was efficient (or sensitive), went smoothly low and high, had great transient response and low distortion, and was small, cheap, and easy to build. A symphony orchestra plays a Forte at 95dBa (slow weighting) in rehearsal and somehow manages to get this to 105dB a (slow weighting) in a performance. The players will tell you a Forte is a Forte no matter when they play it. So my meter must be wrong. A rock concert contract rider frequently asks for 102dB at 100’. A sym phony requires about 30dB of headroom with a Class AB amplifier to prevent my hearing clipping in the sound system. Rock music needs only about 20. So if I want to play music at concert level, my loudspeakers must be capable of 135dB peak level for a performance but only 125dB for a more relaxed listening session. Allowing for two speakers, room reflections, the 10dB advantage of a Class A amplifier, and listening position, 115-120dB peaks from each loudspeaker should be fine. This is quite a bit more than is available from many home loudspeakers. If you put a 500W Class A amplifier on an 88dB per watt loudspeaker, the power compression will probably leave you 4 or 5dB short. Try a 2000W amp, which will get you there very quickly. It might also not sound as good at lower volumes. Most folks under stand it is easier to build a good- sounding (or more precisely, a not bad-sounding) small amp than a large one. Engineering is knowing how to calculate and adjust each parameter of the design to get the desired overall result. Art knows which trades to make and still achieve pleasing results. I am willing to give up size for a loud speaker, but not floor space. In a listening room bookshelves should be on the opposite wall from the loudspeakers. A floor-standing loudspeaker is a reason able first try for a design. I want the tweeter to be about ear height to allow the sound not to be blocked by furniture. I could build a tall narrow version of a two- or three-way sealed box or perhaps bass reflex speaker to meet these parameters, but I suspect using a horn-type loudspeaker will give me the increased sensitivity the smaller amplifiers I prefer require. A well-de signed horn can also decrease the distortion of the driver. To get a match to the high-frequency horn requires a low-frequency horn of enormous size or attenuating the high- frequency driver. 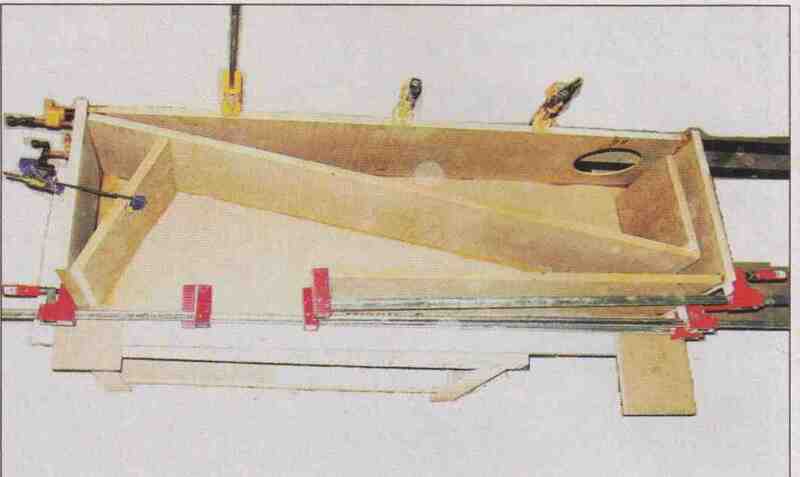 One of the early high- efficiency loudspeaker designs placed the loudspeaker in a corner as part of the horn design using the three planes to extend the horn size. This should give great bass response. Unfortunately, bending the midrange around corners is not a good idea. So for a first try I will use a direct radiating mid-bass to midrange, a horn on the mid to highs, and a horn off the back of the low-frequency driver to get the very lows. That way I can use a fairly standard two-way driver system. 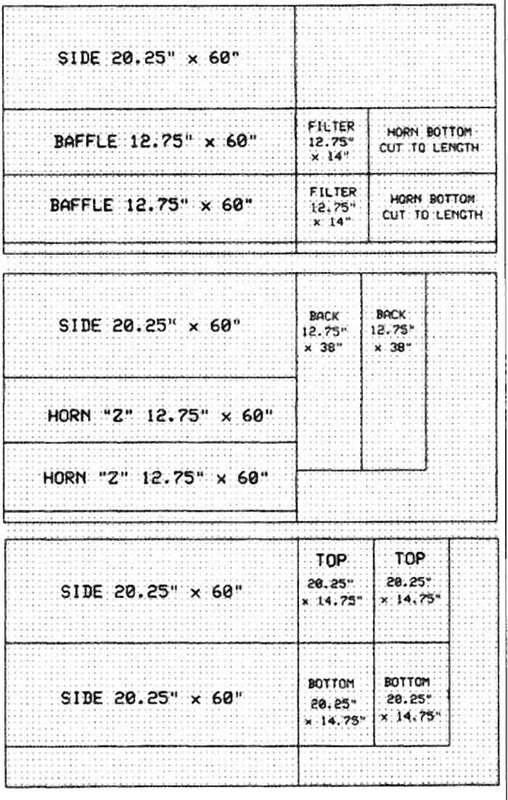 For a matching three-way horn system, I probably would want the midrange horn to be at least 64” in length. I could go a bit shorter and buy a commercial horn. There are three strikes to that approach: one, it would make the speaker bigger than can be unobtrusive; two, there would be midrange to high crossover issues; and three, it’s more fun to build it all. PHOTO 2: JBL driver and crossover. To keep the crossover region smooth and coverage uniform, the high-frequency driver should be close to the midrange source. One of the classic designs is the coaxial loudspeaker, in which the tweeter is mounted centered inside the woofer. The problem with many coaxes is that the tweeter blocks the higher midrange frequencies. One design that avoids this is a through-the-magnet horn design, in which the magnet structure for the woofer is hollow and shaped to form a horn section for the tweeter’s output to pass through the woofer. In addition, the woofer cone forms the rest of the horn. This usually results in a wide dispersion driver system. There are, of course, times when you would want a different horn for better pattern control, but that is not the goal here. This idea has been around since at least 1930. Advantages are that there is complete symmetry of coverage at all angles around the loudspeaker because there is no offset between drivers. This allows the room to add its sound with out being colored by a single wall, the ceiling, or the floor. The tweeter does not block the midrange, and it is also easier to get a good crossover match. In a dynamic loudspeaker a voice coil is suspended inside a magnet structure. (Except those in which the mag net moves and the coil is fixed!) A cur rent applied to the voice coil causes it to move. The coil is firmly attached to a piston, which moves the air and you hear the sound. The assumption is then made that for time coincidence of two drivers covering the same frequency region (think crossover overlap), the voice coils should be even (in the same plane) with each other. One big problem with this idea is when you attach the voice coil to a long very low mass pipe and then connect the pipe to the cone. The movement of the cone is not changed by the length of the pipe! The time at which the sound comes from the cone is not changed. The maximum interface with the air in a typical cone occurs near the forward edges of the cone! With a horn this occurs at the outer edges. I have performed experiments to demonstrate this. If you build a loudspeaker out of two drivers, the coverage narrows as though the center of propagation of the wave front is closer to the edge of the cone, not the center. It doesn’t make it all the way to the edge at higher frequencies because of cone breakup or something yet to be determined. If the tweeter is smaller and lighter than the woofer, there will be some time delay to get from the voice coil to the edge of the horn, but it will be different from the same motion propagating to the edge of a more massive cone. I would need to measure the result to properly design a time delay and align these wave fronts to ensure a smooth crossover region. This is one of the reasons some folks prefer a single driver system. This is an area where philosophy must meet finite element analysis or actual measurements to yield truth. The tweeter requires a horn to get the desired control, loading for efficiency, and wide dispersion. The through- the-magnet coaxial loudspeakers under consideration use the woofer cone as the horn, so there is not a large horn to block the midrange. The concern raised then is Doppler shift distortion caused by the interaction between horn walls (the cone) moving and the waveform (high frequencies) being shaped. Because the cone will be loaded by a very large horn at low frequencies and will not move much, and with Doppler distortion not being very distracting, this is not an area to really worry about. It would also seem that you want as light a woofer cone as possible. This will allow faster propagation at the crossover frequency (smoother midrange), and a low mass cone is more efficient in a low-frequency horn. One of the limitations of cone loud speakers is the “mass break frequency.” Many loudspeakers show wonderfully flat frequency response curves on-axis. When you look off-axis you see they start rolling off at a much lower frequency. That’s because as the frequency increases the cone is large enough to begin to control directivity all by itself. A 15” rigid piston would be almost 6dB lower in output at an angle 450 from dead center when producing a frequency of only 450Hz. If the piston were to move the same distance at 450Hz as it did at 225Hz, the SPL on-axis would need to rise by about 5dB. The energy must go somewhere, and if not off-axis, then on. So most models of direct radiating loudspeakers have the design parameters adjusted to yield a flat on-axis response. Most real loudspeakers have a limit that as you move them faster and faster the mass of the cone will cause the motor, the cone, or connection to the motor to run out of capacity. Remember the equation is ½ x Mass x Velocity squared. It is the V squared component that rises rapidly. The point at which the loudspeaker cone can no longer act as a rigid piston is called the mass break point. Of course, there is some flopping around as to the exact point. 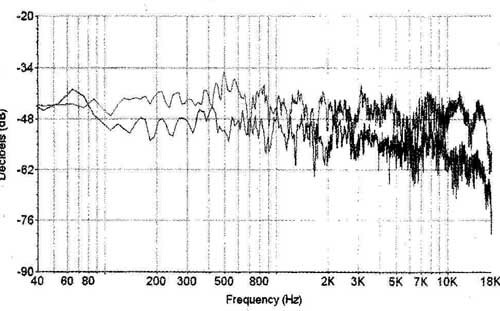 The larger the loudspeaker, the lower the mass break frequency. A larger woofer requires a larger tweeter to reach the frequency where the crossover must be placed. The larger tweeter does not go as high. The question then becomes what frequency range is desired? Or the other version is how loud? PHOTO 3: The speaker glued and clamped with every piece except the last side. You could use a 5” woofer, which would allow a very good high-end tweeter, but you would not have much low-end energy. There is not enough piston area to move the air at low frequencies. Even if you could get a long excursion 5” woofer, you need to worry about power dissipation, breakup under horn load, and just plain small piston area. As you use a loudspeaker, some of the energy causes the voice coil to heat up. 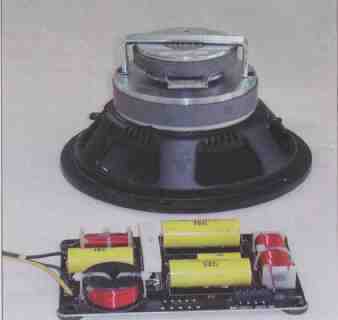 In a well-designed loudspeaker, the voice coil can double in impedance before it is damaged. The problem is that when the impedance doubles, the current draw for the same amp voltage is cut by one half Thus the speaker has 3dB less out put than it should. The heat also more slowly changes the magnet. This loss of output is called power compression. As the loudspeaker cools, it gets back most of what it lost, but in some loudspeakers the magnet slowly weakens from use. A good compromise for this design is an 8” woofer. You can get a big enough voice coil to not only handle the power but also keep its cool. It has enough piston area to give 115dB output at the low end. To get a light and stiff cone requires some sort of reinforced material. Obviously I am not the first person to try this design philosophy. The idea of an 8” woofer with a through-the-mag net compression driver without any horn blocking the cone has existed for at least 60 years. It meets the criterion of a wide coverage angle and is efficient in the right enclosure. The transient response is somewhat inherent in the design of a light woofer with a compression driver if it is a good crossover choice. Picking one that is low cost and low distortion should allow me to reach my design goals. Although the trend today is for small bookshelf speakers or perhaps towers, I can buy ready-made drivers from at least six manufacturers. Looking at websites for reasonable engineering data helps narrow the choices. For a first cut at design I need to choose a moderate-cost loudspeaker that meets these requirements. Keep in mind this includes a crossover with decent-quality capacitors and inductors, a compression driver, a horn, and a woofer. I picked the JBL Professional (not JBL Consumer) Control 328C (Photo 2), which comes in either a 70V or 8-ohm version. Be sure to get the 8 version. This loudspeaker is designed to be a wide-coverage ceiling unit rated at 93 to 98dB/W at lm. Power handling is 1kW peak. It really won’t do a peak of 128dB, but then I won’t be using a 1kW amp. It has a Kevlar-reinforced woofer cone, a real compression driver, and comes with a crossover which even uses plastic film capacitors that are glued to the PC card. It is produced in reasonable quantity, and as such is less costly. The 328C comes attached to a ported baffle that also doubles as part of the horn. I will recycle the baffle, keeping in mind the new enclosure must act as a horn extension. These units even come with serial numbers—mine were 10403 and 10405. It is unusual for a ceiling speaker to have serial numbers! If you prefer you can try a different speaker, but because this is not a common design you will need to look around a bit. List price for the JBL is $320. Try not to pay that. The hard way to design an enclosure (or a listening room) is with finite element analysis (PEA). With this system the air surrounding the loudspeaker system is divided into small blocks (finite elements), and each block is given a model value of resistance, capacitance, and inductance. A stimulus is applied (the speaker cone moves) and the computer then calculates how each block interacts with its neighbors. The best way to figure out how big each block should be is to try a size and then do the same problem again with a smaller size block. Quit making the blocks smaller when you can no longer see the difference in outcome. An easier way is to use one of a number of classical equations that you can figure out with a pocket calculator. Be sure to measure the result to see whether the equation you used worked. Mine never do, which is why I use an FEA program. It is really important to measure after you build to see how accurate your design was. It may seem silly, but after you measure enough, eventually some thing you never saw pops out at you. I once did a job using a specific loud speaker, whose published frequency response curves did not match what I measured. I measured the amps providing in excess of 100V to the tweeters, yet there was inadequate output and no tweeters were blowing up! An examination of the loudspeaker showed that the crossover passed no signal above 8kHz to the tweeter. The actual power making it into the tweeter was less than 3% of the amp’s output. The curves they published were predicted by home-grown software and never confirmed! Part of the design process is to be sure you can actually make what you design. I had some 1” particleboard left over from making counter tops, so I made a 3ft enclosure to try out the loudspeaker driver. My program showed that with a 3” diameter port 2” long the low-frequency driver/box combo should be dead flat to 30Hz and then smoothly roll off. My measurements showed a 40Hz rolloff with a slight bump. This means that either I can’t measure very well, the loudspeaker parameters are wrong, my prediction software is not perfect, or any of several other causes. There were also big bumps in the mid frequencies. One dip was caused by the wavefront coming off the back of the cone hitting the enclosure back wall, then bouncing forward to cancel some of the outgoing wave. Two inches of fiberglass on the back was not enough. Six inches fixed that. There were also bounces caused by locating the speaker on my workbench. Moving the micro phone and loudspeaker showed which bumps they were. Now I could try some horn designs, having a feel for the limit of my de sign method. I was able to almost predict the low-frequency response and its smoothness. The program was able to show several design options based on my design goals of size, speaker position, ease of construction, and low-frequency response. I saw that using a good corner load with a reasonable length horn would get me close to what I wanted. I had a mid- bass dip I didn’t like, so I tried placing a filter before the horn mouth to limit the horn to the lowest frequencies. Because the programs’ limit seemed to be 20%, or about 2dB, going much more refined without testing seemed pointless. PHOTO 4: The box just before final glue-up. Being cheap, I wanted to use as little wood as possible in the design. Wood comes in either 48 x 96 (sometimes 49 x 97)” sheets or in 60 x 60” sheets. Most of the lower-cost wood products are stocked in 48 x 96” sheets. I figured setting the cabinets about 60” high at ear level would allow use of either size of wood. I do not like harmonically related dimensions for acoustic enclosures. Ratios such as 1:’ are good. Using one sheet of wood would require getting eight sides out of the 48” width. That would make the small side 4.75” and the big side 7”. An 8” woofer would not fit in the box. With two sheets you could get 9.5” x 13.25”, including overlap at the sides. That would give an internal volume of over 4ft. Allowing half that for the woofer chamber and the other half for the horn would allow you to have a low-frequency speaker contribution down to about 38Hz, or so the prediction program tells me. That is almost low enough. But I was almost wrong before, so caution is in order. Spring for one more sheet. You now have enough to allow for mistakes. If the box internal dimensions are 12.75” x 18.25” x 60”, there should be adequate volume without any overlapping resonances. You have a good size. It should be able to go down to the 20Hz range and still fit nicely in the corner of the room. Being lazy, I designed the box with a straight horn. At the low frequencies this seems to have very little effect on the horn. A simple low-pass filter was predicted, so I used the simplest filter I thought I could get away with. This amounts to a single piece of wood. I placed a small thin piece of fiber-glass in the filter passage just in case there were any side wall problems. For ease of construction you can make the design of 1” MDF, HDF, particleboard, or plywood. The preparation of the material requires only straight cuts. To make the speaker “furniture,” either paint or veneer it. If you use ¾” material, you might choose a slightly fancier edge, either a dado or a miter. Be sure to double-up the front baffle if you use thinner material to allow for recessing the driver into the baffle. No matter how you decide to build it, this is a two-person job. The finished speaker should be heavy. If you use ¾” material, you can keep the same external dimensions—it will not make much difference. There is enough extra material to make the extra baffle backer pieces. The first step after obtaining the parts is to disassemble the loudspeaker. Carefully unplug the woofer and tweeter connectors. JBL has cleverly used different size connectors for each terminal. It requires real imagination to reassemble them incorrectly. I know. Next remove the screws that come with the baffle. Remove the crossover from the baffle. Keep the rubber crossover mounts, which will help decouple the crossover from the en closure. Be careful not to get dust into the drivers. The dust cap on the woofer is really just a grille for the tweeter and will allow small stuff in, so be careful. The cutting pattern is shown in Fig. 1. If you use ¾” material, don’t forget the baffle backers, which should be 12.75” x about 14”. When using any power tool try to end the job with the same number of fingers you started with. Long, straight cuts may seem simple, but saws kick, people place their digits in the strangest places, and rip cuts with power tools account for most of the lost fingers in small shops. Of course, you will wear eye protection. As someone interested in audio, you will also use hearing protection. And because breathing seems to be a hard habit to break, you will also don a dust mask. You can set up the wood on four saw- horses or some other support system. If you have a tablesaw, you can cut to rough size and finish on it. The pieces will fit better if you cut all of the same dimensions at the same time without re setting the fence. If you don’t have a tablesaw, just be careful, clamp a straight edge to the board, and follow it with the saw to get a finish cut. If you don’t have a straightedge, cut one from the third board. Then use it to cut the rest. I prefer to start with the shorter cut across the material on each piece. Then I do the longer straight cuts. That way my material is balanced better on the sawhorses and I am not trying to move many heavy pieces. You can use square cuts at the edges of the two boards that form the “Z” of the horn—a small gap will have no effect. However, be sure they are securely glued, or a buzz could occur if the pieces rub. If you prefer, you can bevel the edges about 17° to form a tighter fit. You can cut the bottom of the “Z” last. Trim it flush with the back or recess it a bit if you want to place a grille on the horn mouth. After you’ve cut all the pieces, rout the driver cutout. If you use two pieces of ¾” wood, you can probably get away with cut ting two circles. The one in the front piece needs to clear the entire driver basket. The rear hole should be smaller to allow you to screw the driver into the baffle. The driver hole should be 6½” down from the top of the baffle board and 1” off center. I just don’t like symmetry in resonant locations. I used a template to rout the hole. Using collars and a template allows me to use a big collar to rout all the way through the baffle. I can then use a smaller collar to rout the recess or I can use a bit with a guide bearing to follow the outline of the hole and cut the recess. I did one speaker each way. On the first try I did not recess the driver. After listening to it, I used a panel cutting bit with a bearing guide to simulate the horn flare that came with the speaker. Try to get the speaker lip about 1/8” inside the baffle board with a smooth curve to the surface. The goal is to copy as close as possible the baffle that came with the driver. If you do not own a router, just cut a round hole and surface-mount the driver. There will be a small difference in the final sound. If you use ¾” wood, mount it to the backer and clear through the baffle. You might want to round the edge with a file, a surform, sandpaper, a dremel tool, or scrape it with a knife. If these directions seem to lack more detail, it is because you can use just about any method to make the opening: a reciprocating saw, a router, or even a hand saw (HDF cuts very easily). Just make a round hole about where it should be. It is better if you make a super precise recess mount that copies the original, but it is not that big a deal. The horn seems to form a classic “Z” shaped folded horn, but it doesn’t. The top board of the “Z” is parallel to the top of the speaker. It is spaced to form a chamber with exactly 2 x 12.75” of cross-section area. It is long enough (14°) to form a resonant chamber. This is the low-pass filter to keep low mids out of the horn. It seems way too simple, but I tried it both ways and the filter is a big improvement. The middle board of the “Z” fits tightly into the bottom front corner of the box. It is the same size as the front baffle. It should end about 2” from the top and back. The exact placement should be close. It is more important for the filter board to mate cleanly and stay parallel to the top. The board at the bottom of the “Z” is part of the horn. Its exact placement is not critical. It should touch the middle “Z” board about 6” from the bottom and go to the back bottom. You can test-fit it and trim to length. FIGURE 1: The cutting pattern. Be sure to place all the pieces together before gluing to be sure they fit. If it is a small piece that is being disagreeable, you should have enough scrap to make another piece. If it is one of the bigger pieces, try trimming all the affected pieces. A 14” change in any dimension is not radioactive. If you are as sloppy at cuts as I can be, you will really appreciate the modern urethane glues, which foam up as they set. This seals all those annoying gaps you get when your saw cuts are not perfect. I prefer Elmer’s ultimate high-performance glue. The cap closes tighter than the other well-known brand so the glue stays good longer. The downside is you should wear gloves when using this glue and be sure to put a drop cloth under the workpiece. Of course, ordinary wood glue or the improved yellow stuff is also a good choice. You can just glue and clamp the pieces, or, as in the more classic home-built method, use glue and screws every 6 to 8”. You don’t need to clamp it if you use screws, but it can’t hurt. You didn’t hear this from me, but nails and glue will work also. I started with the side down and fit ted the bottom piece, then the front baffle, followed by the top. The long diagonal of the horn fits into the front bottom corner. It does not need to be tapered; a small leak here is unimportant. At this time, mark two lines about 6 and 7” up from the bottom end, and then put it in place. The top of the horn “Z” is next. Be sure you have a uniform 2” channel from the top. The bottom of the “Z” should fit between the two lines you made on the long horn diagonal. Check it for fit and trim the length. Finally, fit the back. Check the other side fit. Glue every thing except the second side. As you can see in Photo 3, the speaker is glued and clamped with every piece except the last side. 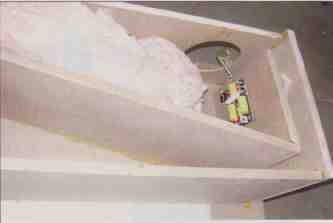 This allows placing the crossover and fiberglass into the box when it is easy. Photo 4 shows the box just before final glue-up. The crossover and fiber glass are installed. A very small thin peeling of fiberglass is placed in the pas sage that forms the low-pass filter. This should be about ½” thick and about 10” long. Five screws hold in the crossover. I kept the factory mounting grommets and just used drywall screws to mount it. Be careful so that it will come out later if needed. You can put a cup for the terminals anywhere in the back of the loudspeaker. The crossover has a well-marked re movable connector for the wire. It is designed for 12-gauge or smaller wire. I had no trouble using 10-gauge wires. The connector has four terminals to make it possible to daisy-chain the speakers in ceiling use. If you want to be a tweak, re-braid your speaker wire and use all the terminals to reduce the resistance of the connection. If you use solid wire, you can use either just one cup or a jumper. I simply ran a piece of West Penn Wire /CDT 25210 10 Ga. wire from the speaker connector out the back of the horn. When the innards are done you can glue on the remaining side. Use screws, clamps, or both. After the glue sets you can finish the box. Carpet or fabric is good if you want the ‘80s band look. I suggest painting it the same color as the room where the loudspeaker will live. I recommend veneer and a grille frame. The crossover has quick connects for the driver and a plug for the speaker wire. The driver mounts with drywall screws. I did not use a gasket because my routed edge was reasonably smooth. There is not a great pressure differential as in a sealed box speaker, which is why the seal is not very important. If you prefer, run a light bead of silicone sealant to seal the driver to the box. It will take two humans to place the speaker, which should be at a 45° angle, tight to the corner of the room, but ½” from the walls. If the box is out too far you will get bumps in the bass response. You may wish to jiggle the placement to get the low-frequency response to suit your taste. The first loudspeaker I tried had the mounted driver protruding from the baffle by a small bit. I also did not put in the horn’s low-pass filter. When I first turned it on, the results were not pleasing. Using an old Ashly PQ-66 parametric notch filter, I swept the speaker. As you probably know, when there is a bump up in the frequency response of a speaker, it sounds bad. When it’s a dip, you must listen for what is missing. The sweep immediately showed that there was not enough fiberglass in the box (resonance around 400Hz), there was a harshness around 3200Hz (impedance dip), and I needed the bass horn’s filter. I assembled the second speaker with a routed recess approximating the original baffle, used way more fiberglass, and added the filter. This speaker was much better, so it was time to modify the first one. I broke in the speakers for three days. I tried three different amps with the loudspeakers. One was a typical mass- produced 60W class AB amp that produced quite pleasing results. I also used a solid-state single-ended power amplifier from another project. It was more detailed than the first amp. I used my improved “butterfly” amplifier for most of the listening. The loudspeaker proved quite disappointing. I know this is where the author is supposed to list some recordings he/she used to evaluate the loudspeaker and pretend that most folks know the recordings intimately and can share the experience through common knowledge. 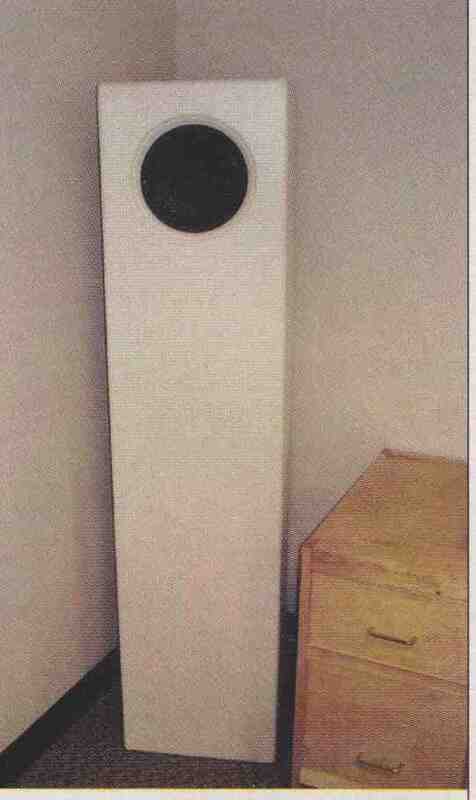 This loudspeaker had the audacity to make many of what had been satisfactory recordings of musical performances sound like pale studio imitations of music. I could identify that some of the choruses on the recordings were re ally just sampled and replayed, not done live as I had previously thought. There was one song in which I used to think the singer was tapping her foot to keep time; it was actually the bass drum in the background keeping the singer on track. One of the CDs of a popular singer now sounded so bad it could pass for a spoof of a performance. I am slowly learning that I prefer live recordings. Studio recordings are adjusted to the producers’/engineers’ tastes, while they are spending large amounts of time in a small padded room. I have better speakers, amps, and a more realistic listening environment. Somewhere between 4% and 20% of the recordings I listened to with this loudspeaker could be mistaken for an actual live performance, depending on the type of music and the re cording methods. Worse yet, a recording that really did not impress me now sounded wonderful. The drums that could be heard before now match the piano and balanced the piece to where it was downright nice (Edward Simon 1995 KOKOPELI Records). The low-frequency response of this system is far better than any loudspeaker I have ever heard. The folks I have played it for all find that the low frequencies are quite different than what they heard. The first thought is that there must be some obscene boost in low frequencies. My measurements show the low frequencies are flat to the limit of my test setup. I expected it flat only to 25Hz. This time it is possible my model erred by predicting too high a rolloff. The plots (Fig. 2) show the speakers’ performance on-axis and as far off-axis as I could get in the room. I used white noise with an FFT analysis plotted on a log scale. This is unsmoothed data with a 10Hz resolution. The low end is flat to the limits of the measurement. I placed the speakers on the narrow 20’ wall of my office; the length of 45’ allows a low-frequency resonance of 12 to 13Hz. The limit on perceived low-frequency performance was, to my surprise, affected by the amp. I previously did not worry about low-frequency performance in amps, which used to be one of those it-does-not-matter issues. Now for the first time I got almost unbelievable lows. I don’t yet have a feel for what I can and cannot hear, but I will play with what I send to the speaker to see what are my limits of audibility. The engineering process allows you to design a system, build it, test it, and see what you have learned. The problem with such low-frequency response is twofold. First, some amps really do not have the frequency response to get the full response out of the loud speaker. Second, many recordings are “engineered” on loudspeakers that do not go this low. If the bass is boosted to sound good on the studio monitors, it is overpowering on this loudspeaker. Because a loudspeaker is also sup posed to produce more than just bass, I must admit that the design has some weaknesses. There is an impedance dip about 1.6kHz, which shows up as a slight harshness in the midrange that is amplifier-dependent. The upper mid range seems a bit suppressed. The highs roll off around 18kHz. I put two loudspeakers on a single amp with a monaural source to judge imaging and driver match. There was one range of mid to highs and one mid bass region where the image moved left. This indicates the loudspeaker or the room is not perfect. The movement was about one-quarter of the soundstage. This is not that bad for unmatched speakers. I do not hear the crossover between the woofer and tweeter. I can look at my measured curve to see where it is, but the timbre difference you sometimes get with horn-loaded compression drivers does not jump out at me. Neither driver strains to reproduce its range at normal listening levels. One demonstration I like to do is play 30kHz through a small loudspeaker that has a sharp output resonance and ask people whether they can hear it. Every one says no. I then turn it off Everyone then agrees that it has gone off I switch it on and off a few times so that the subjects realize that they are hearing it, but do not perceive it as a tone, just a presence. It is simply a matter of level as to what you can sense. This loudspeaker does not go that high. I can still hear an amazing amount of detail through the speaker, so I suspect much of the openness is not due to frequency response on the high end but rather good transient response in the midrange. But this is something I will need to play with to be able to quantify it better. This is not the be-all, end-all loud speaker. It covers a whole room, plays loud even with small amps, and goes way low. It’s OK going high. It is reasonably smooth, but a few details may be missing. Of course, this speaker driver is designed for distributed ceiling use. It does, however, make several of my older high-end loudspeakers sound broken by comparison. The loudspeaker is great for three particular applications. One is for aerobics—loud music, great bass, fits out of the way in a corner, and is modest in cost for a professional loudspeaker. The second application is home theater. You will have guests jump out of their seats the first time they hear what is really on some of the soundtracks. The third great use is for music at a party. With its good low-end uniform coverage, I recommend mixed drinks or microbrews—this is not a loudspeaker for cheap beer. There are still things to play with. First, I will try substituting air-core inductors for the two iron-core ones. This is not a big issue, because of the low level of power used with the loudspeaker. Second, I will try it bi-amplified. I will use this loudspeaker with a digital processor such as a BSS Soundweb or Ashly Protea. My CD will typically send an AES data stream to the processor, which will be programmed to act as source selector, volume control, equalizer, and, if needed, noise gate. With only the D/A converter and clock in what is now my “preamp,” there are far fewer parts to get in the way of the sound. Oh, yes, I don’t mind using tone controls. . . how do you think the recordings got made? If you think that perhaps this design could be adapted into just a monstrously good subwoofer/speaker stand for existing speakers, you are right. But then that is a different loudspeaker.